Ergovision 710 Point of Sale Desk Mount | ICWUSA.com Inc. 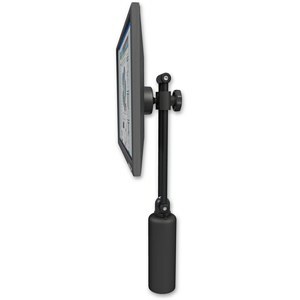 The Ergovision 710 Desk Mount is your best choice for point of sale locations. This system was ergonomically designed to reduce users’ neck pain and stiffness, with easy adjustability of monitor height and viewing angle. It can be used in either standing or sitting positions. The Ergovision 710 rotates 360°, adjusts vertically 9 1/2″ (24.13 cm), and tilts back and forth 60°. You can choose from four heights of desk risers: 1″ (2.54 cm), 3″ (7.62 cm), 5″ (12.7 cm) or 7.5″ (19.05 cm). This system has been used extensively in bank teller stations and airport kiosks. Machined out of aircraft quality aluminum, the unit is powder coated for a durable, lasting finish. Hand assembly ensures that a quality product is shipped to you.